As you can see from these photographs we don’t just clean and seal stone floors we can also rectify problems with wall tiles as well. In this case our customer had a problem with Travertine installed in a shower at a house in Stockport which had not been sealed following installation. 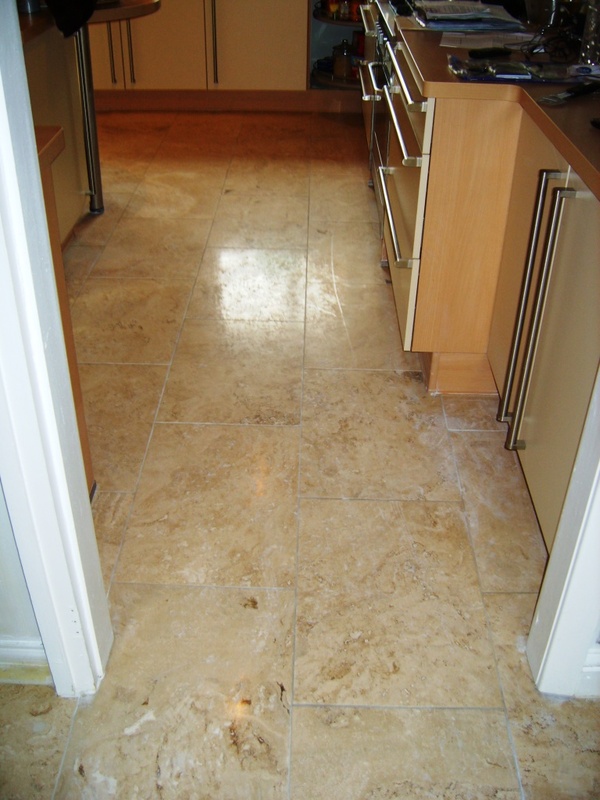 Travertine is porous and over time the tiles had becomes stained with the dyes and soap scum, mould had also managed to get a grip in the pores of the travertine. To get the Travertine back to its original condition it was necessary to use a dilution of Tile Doctor Pro-Clean with a set of six inch Burnishing pads, each one serves a different function from scrubbing to polishing, the buffing pads are applied with water and restore the shine on the surface of the tile. The Tile Doctor Pro-Clean also came in handy to clean the Grout, its best applied with a spay attachment so it can mix with air allowing it to dwell on the tile before being scrubbed with a stiff brush and washed down. 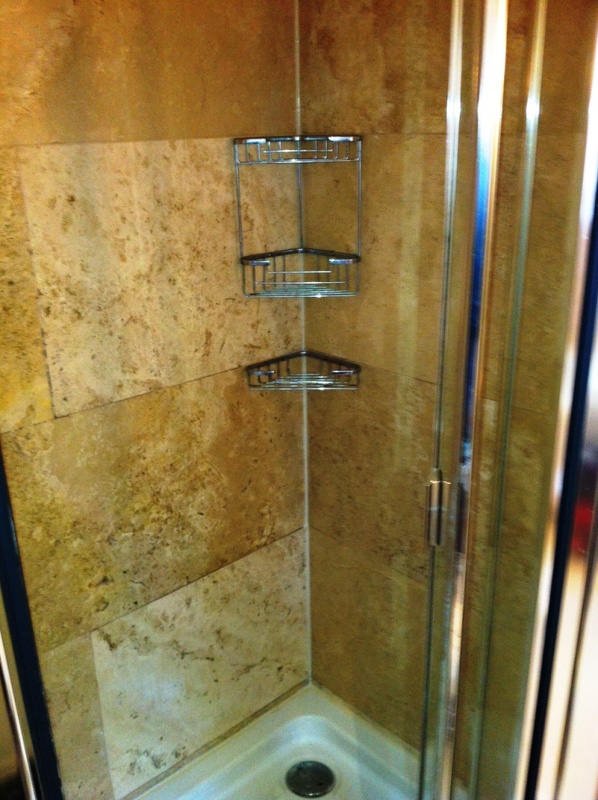 The whole Travertine Shower tile was washed down with water and left to dry before sealing. 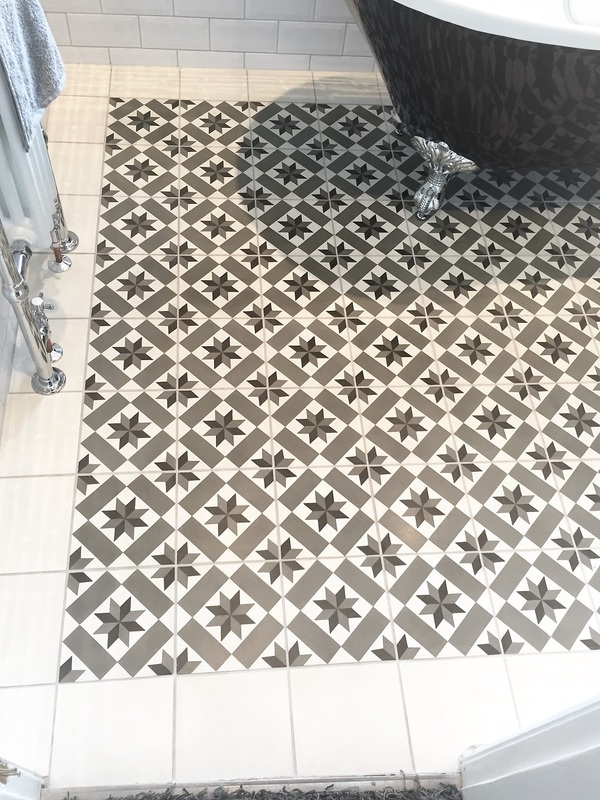 Last step was to remove and replace the silicone seal at the bottom of the tray using mildew-resistant Mapei Mapeisil Silcone in Jasmine in order to match the grout. 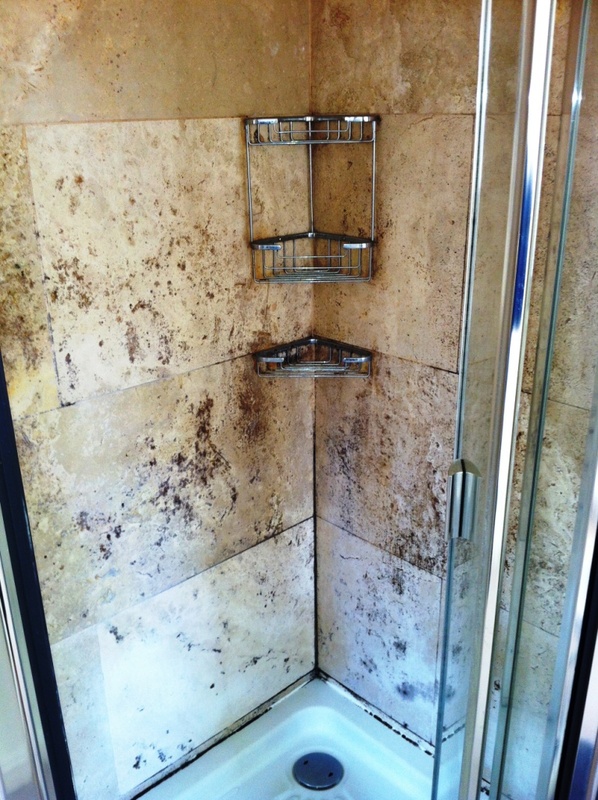 Once the shower was dry we sealed the Travertine using two coats of Tile Doctor Colour Grow which brings out the natural colours in the stone as well as providing surface protection. The sealer will wear off over time so it will be necessary to reapply it from time to time however it will prevent the problems from re-occurring. The transformation was quite remarkable and the customer was extremely happy with the results. 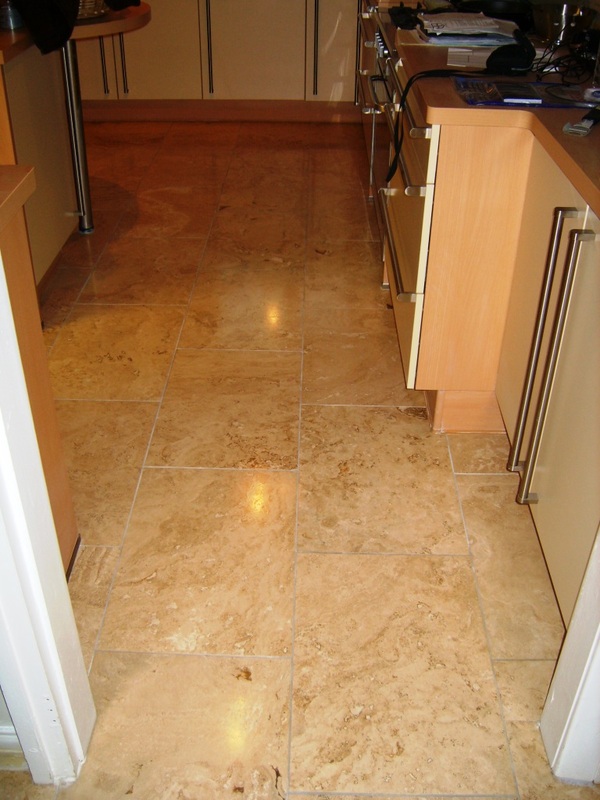 The owner of this modern bungalow in Stockport requested that we visit and rejuvenate the Travertine tiled floor installed in their kitchen. 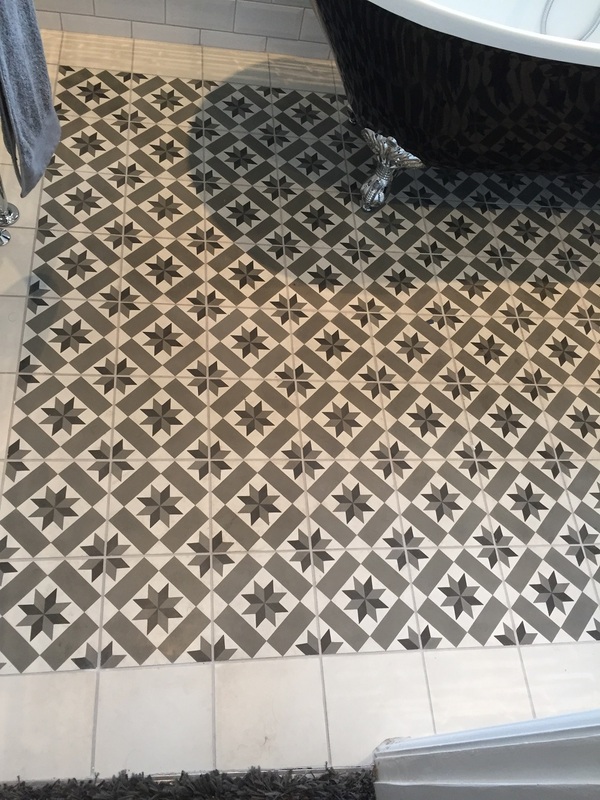 Stone floors do loose their appearance over time and so if you want to keep them looking good it makes sense to call us in every few years to give them a face lift. For the best results hard stone tiles such as Travertine and Marble etc. need to be polished with a set of Burnishing pads however before you start that process it’s necessary to remove any surface dirt from the floor first, this will ensure any grit that could get trapped in the burnishing pads and scratch the floor is removed first. With this in mind we washed the floor using a mild dilution of Tile Doctor Pro-Clean, this was also a good opportunity to get a stiff brush into the grout lines and give them a good scrub. We washed the floor down with clean water using a wet vacuum to remove the water from the floor before moving onto the next step. We polished the floor using a set of 17” Burnishing pads fitted to our weighted polishing machine; the pads are diamond encrusted and you start with the coarser Red pad designed to remove sealers before moving on to the White, Yellow and finally Green polishing pad to achieve a high shine finish. The last step was to seal the floor which we did using two coats of Tile Doctor Colour Grow which is colour intensifying sealer that will provide on-going durable surface protection as well as enhancing the natural colours in the Travertine tile. The kitchen wasn’t a large area and the Travertine dried quite quickly so we managed to clean, polish and seal the floor in the same day.